A single point of administration is given with a school wide account. A school wide admin has the ability to manage school wide account information, teacher/user accounts, and school content subscribers. Also, the console is used to communicate school related alerts, back pack notices, and announcements. Did you know that parents and students are 4 times more likely to acknowledge an electronic communication in minutes compared to a voicemail? So why spend so much on call-out solutions that just leave voicemail? 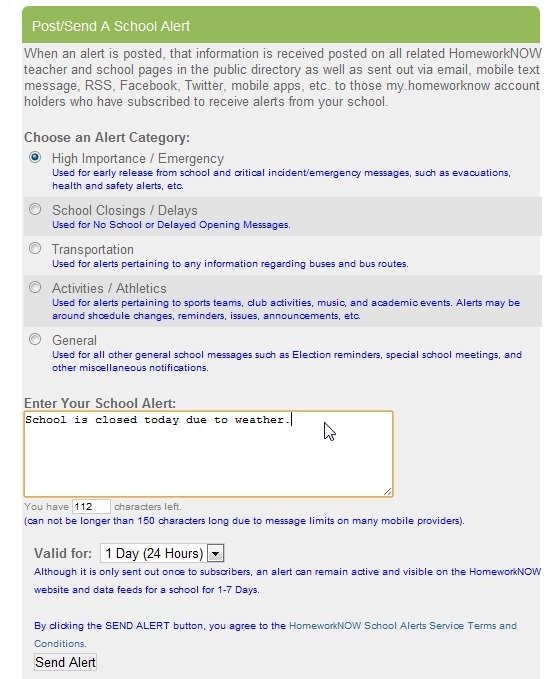 The school alert feature is a great way to convey important school alerts such as school closings, delays, and emergencies. When an alert is posted, it is received by parents and students in a variety of ways (school pages on HomeworkNOW.com and school website, email, mobile device apps and text message, desktop alerts, interactive TV, and 3rd party social networking websites such as Facebook). With the My HomeworkNOW & School Alerts mobile app parents and students can: receive school alerts (such as closings, emergencies, back pack notices, announcements, etc.) with real time notifications, view the latest school wide notifications on-demand, view classroom information and homework on-demand, get notifications when teachers update a class page or homework assignment. Finally a Free App that keeps parents connected to your school!!! Extend your school's Powerschool or Student Information System investment. the Powerschool/SIS Alerts addon to let your parents receive Powerschool/SIS alerts through HomeworkNOW's many communication channels, including text message, Facebook, Twitter, iPhone and Blackberry Apps, RSS and more! Helps schools get greener as it allows an admin to post and maintain paperless Take Home Notices from your school. No more excessive printing costs and paper waste. Every time a take home notice is posted, such as "New Cell Phone Policy," parent/student subscribers receive an alert that a new notice is posted via email and mobile device, and the notice is posted on my.HomeworkNOW.com. Notices can be uploaded as a file, or for more simple notices, the site can build and post a take home notice from scratch and store it in PDF format. 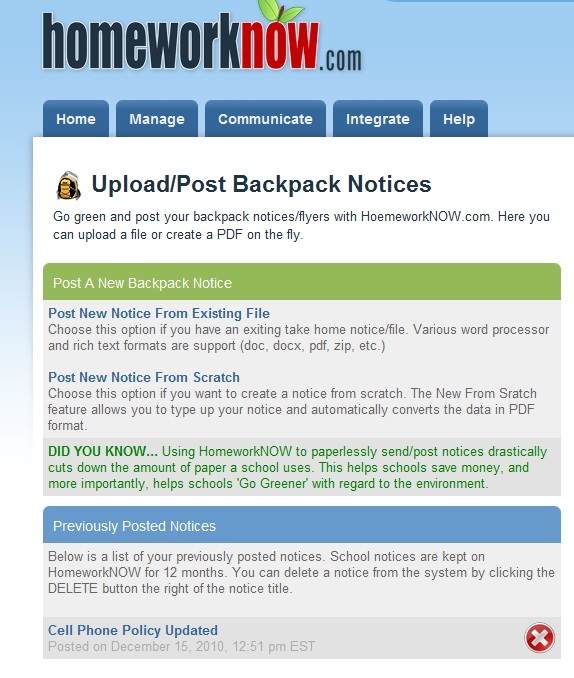 The School News Ticker allows an admin to post school announcements on your school's student/parent HomeworkNOW pages. The News Ticker is a great way to convey non-critical school news such as sports scores, upcoming events, long term notices, etc. Your school gets a unique URL that you can give parents to sign up for school notices/alerts via HomeworkNOW. 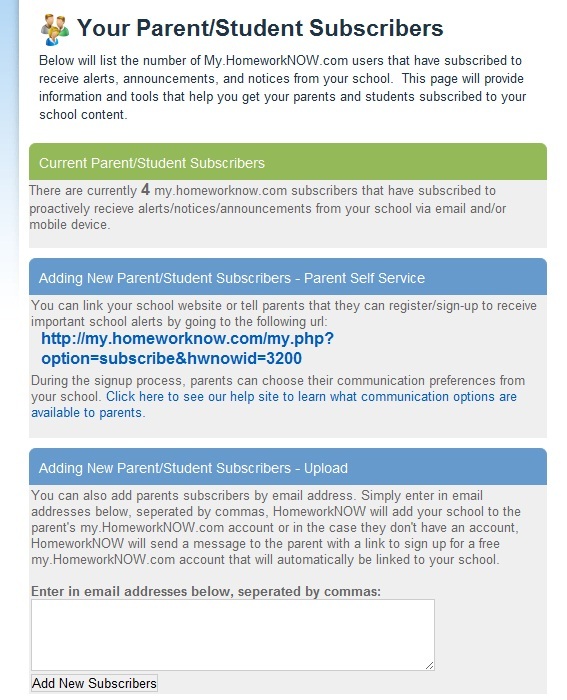 If you have parent email addresses if you are switching over to HomeworkNOW from your existing school to home communication solution, you can get parents setup with HomeworkNOW in seconds. 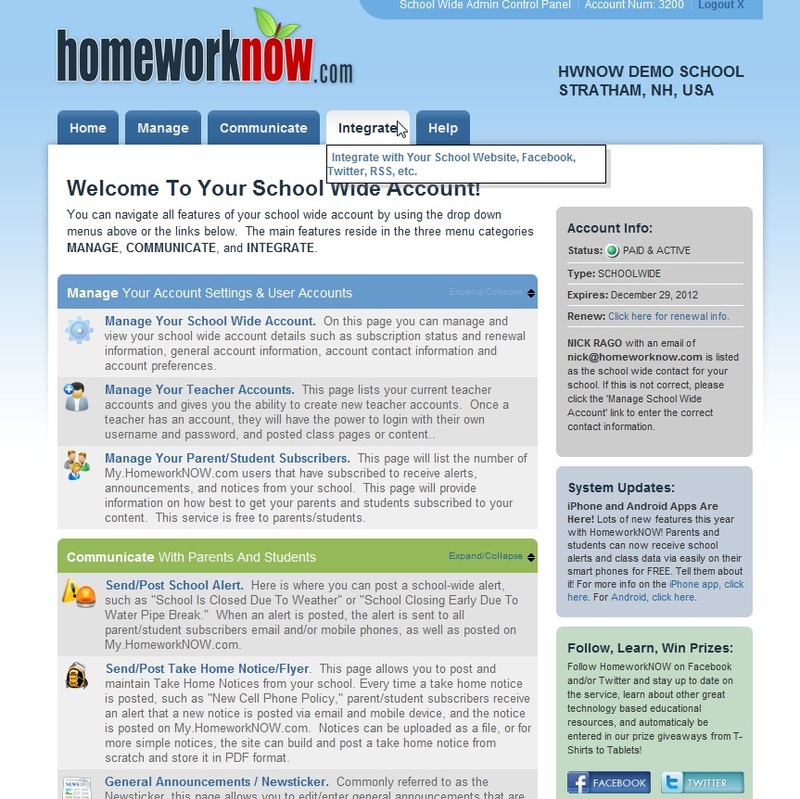 Just paste in their email address and HomeworkNOW will guide them through creating a free My.HomeworkNOW account. Because HomeworkNOW is a hosted, web based solution, there are no servers and equipment to buy and no consultants to hire. Our pricing is the most competetive in the industry and are also eligible for e-rate.